Teknosign’s Automixer is the perfect tool for today’s high-quality voice reproduction needs in the field of “Public Address”. Ensuring the perfect intelligibility of messages to listeners, the Automixer is designed to operate in highly reverberant environments such as: churches, stadiums, conference rooms, exhibitions, shopping centers, supermarkets, concert halls, museums etc. It can also be used in large sports facilities where the highest reliability is also required. Automixer is available in three versions: stand alone mixer, powered mixer and powered mixer with 100V output line. The principle of operation is essentially based on the automatic opening of the microphone signals when they are actually used, by making use of a sophisticated analog preamplifier control section. This minimizes the number of simultaneously active microphones reducing the environment background noise giving you as a result a superb sound quality. Another important function is supplied by the proprietary digital control. A dedicated plug-in automatically adjusts the output level in proportion to the number of active microphones. When only one of the microphones is in operation the gain of the circuit will be 1. By varying the enabling of the microphones simultaneously in use, the implemented algorithm provides for keeping the gain amplification constant, largely reducing the possibilities of reaction of a Larsen effect. 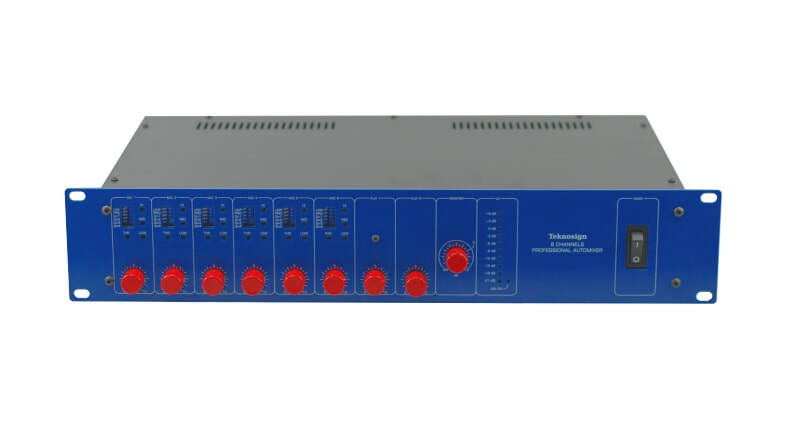 Automixer is equipped with 6 microphone inputs with low-noise transformer input circuits, internal power switch “Phantom” 48V per channel and professional Neutrik connectors. To achieve maximum speech intelligibility in very large environments, further circuit solutions have been adopted. In particular, a three-band stage equalizer with compressor, gate and limiter for each microphone channel. 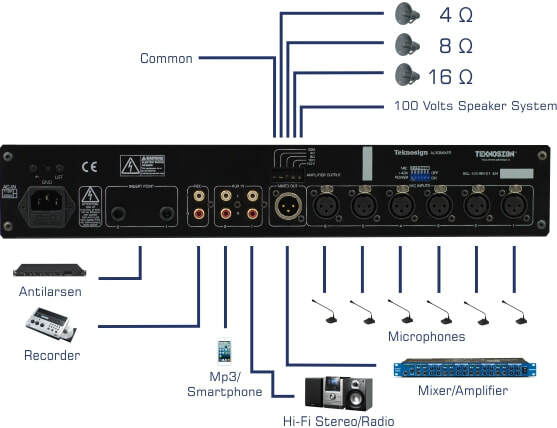 The unit also has two auxiliary inputs (AUX) in order to connect recorders, compact discs, radio microphones, smartphones or tablets and any other playback device. Insert and direct out-balanced sound for the master section. Rec out and an electronic 10 step LED VU-meter that shows the level of the output signal avoiding overloads which could damage speakers and power circuits.